After nearly a year of waiting, we have finally received the Army’s internal investigations into the 2009 deaths of six soldiers from Bowe Bergdahl’s unit: Morris Walker, Clayton Bowen, Kurt Curtiss, Matthew Martinek, Darryn Andrews and Michael Murphrey. Bergdahl has been blamed in certain quarters for the deaths of these men, which occurred in late August and early September of 2009. (Bergdahl walked off his post at OP Mest on June 30, 2009.) Soldiers who were in Afghanistan at the time said these men died—directly or indirectly—as a result of the massive efforts to look for Bergdahl. Some high-level commanders, such as retired Lt. Gen. Michael Flynn, have said the same. In our final episode of Season Two, we reported that we also couldn’t find any evidence linking these deaths to Bergdahl’s disappearance. 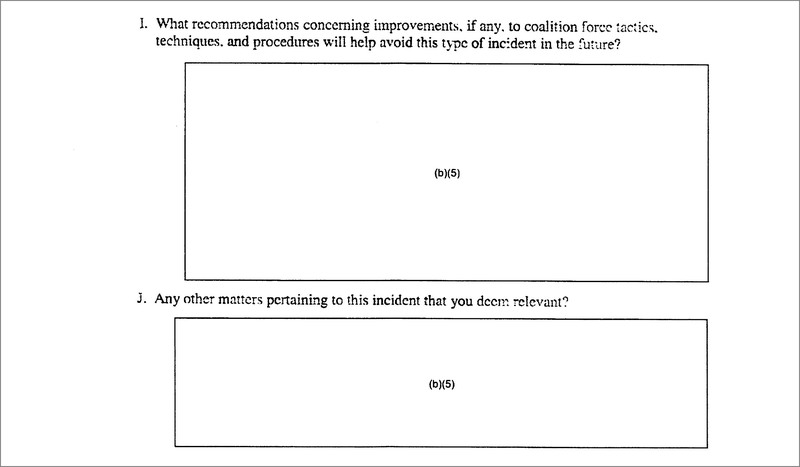 But we couldn’t be sure, because we hadn’t seen the Army’s investigations, known as 15-6s, which tell you what the mission was supposed to be, what actually ensued, and what, if anything, could have been done differently. But now we’ve got them. Here’s what we’ve learned: None of these investigations report that any of these men was on a mission to look for Bergdahl. Neither Bergdahl’s name, nor the term DUSTWUN (shorthand for a missing soldier), appears in any of the documents. The 15-6 for this incident says that Bowen and Walker were trying to secure voting sites in Dila district for the upcoming Afghan presidential election. They ended up in a village where locals told them there were more than a dozen IEDs planted. Bowen and Walker were in the same vehicle, an armored truck called an M1151. They were just pulling out to go to another village when they ran over an IED. 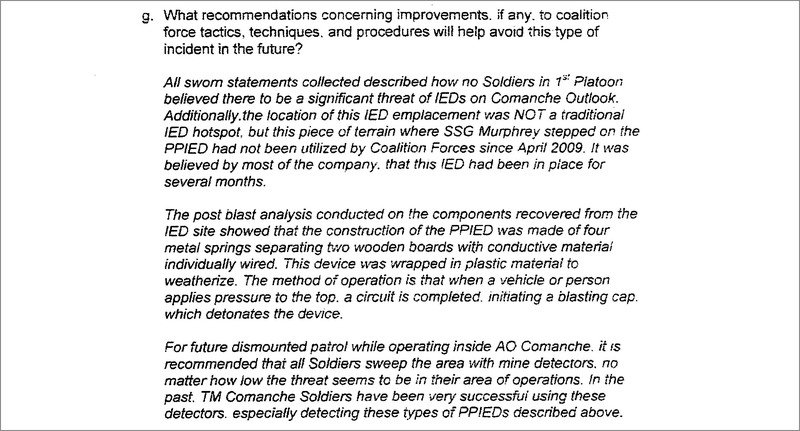 In this investigation, there’s lots of discussion about whether the men should have been traveling in an MRAP instead. MRAPs are designed to withstand an IED explosion, which means Walker and Bowen probably would have survived. But MRAPs are also a lot more cumbersome, and if they break down they can’t be easily towed, which means soldiers can get stranded for days in a hostile area waiting for a flatbed truck to come to the rescue. It turned out Nooradin was at the clinic, and he fought off the Americans and Afghans who’d come to capture him. Curtiss died in the firefight. This patrol was part of a larger, battalion-level operation to push back into hostile villages near Yahya Khel, not far from where Bergdahl went missing. The 15-6 says on this particular day, the mission was to kill or capture AAF (anti-Afghan forces) targets, and to gather information. Andrews and Martinek were in a convoy that was getting ready to leave Palau when the first truck hit an IED. Then the rest of the convoy was attacked by “approximately 17-19” RPGs, according to the report. Martinek was hit by gunfire; Andrews was hit by an RPG. Soldiers we interviewed told us that after Bergdahl walked off, they were continually told to be on the lookout for him, or for information that could lead to his recovery. They said every time you left the wire, you were supposed to be looking. But a general if-you-hear-anything reminder is different from a direct search mission. Again, none of these 15-6 investigations mentions a missing soldier, or intel about a missing soldier, as the objective. “Whereabouts of the DUSTWUN” means Bergdahl. The second day of the patrol, they came under attack. Allen was shot in the head. One man was hit in the hand by an RPG; another was wounded by shrapnel. This report includes an extensive discussion about what went wrong on this mission. 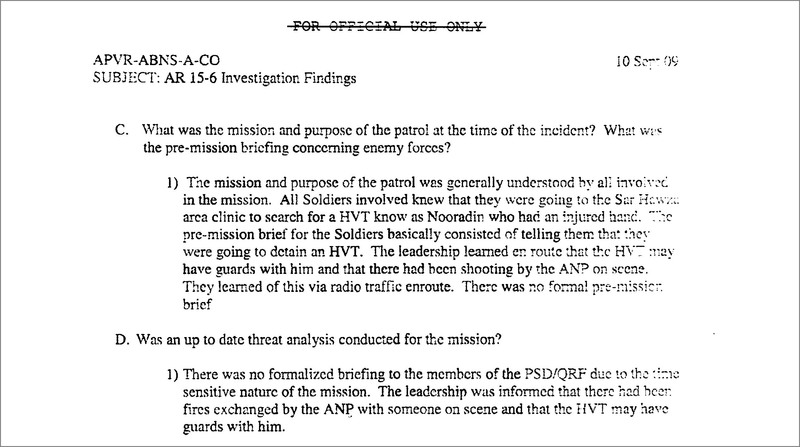 It says the patrol was horribly planned and badly executed in every possible way. Which is in line with what some soldiers and commanders told us in interviews: that in the days and weeks right after Bergdahl left his outpost, there was such a scramble to find him that soldiers were sometimes left under-equipped and vulnerable. 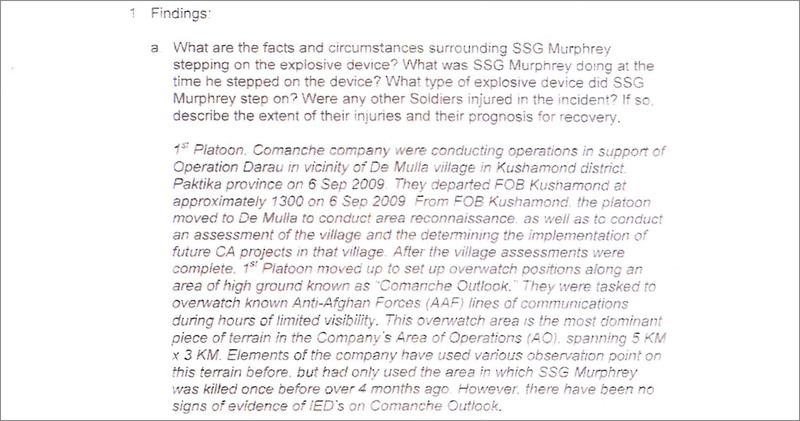 But whether any deaths can be attributed to the search for Bergdahl, according to the Army, the answer seems to be no.